Delaney Maxwell is crossing a frozen lake one day when she slips and falls, fracturing the ice and falling into its dark and dangerous depths. Unable to find the surface, Delaney drowns and is rescued 11 minutes later from the water by her best friend, Decker. She should be dead, shouldn’t she? However Delaney breaks the odds, lives but is in a coma for 6 days. Technically she’s brain damaged, she shouldn’t be able to speak, walk or do any of the normal day to day things when she wakes up – but she can. Nothing seems to be wrong with her, but something seems to have changed in Delaney. She finds herself unknowingly drawn to the dying – a new found sense that will change her life forever. Fracture was a really good read; I read it in only two sittings and was constantly being drawn more and more into the story. However; I did find that it was quite rushed at times. I also felt it could have been written a bit more smoothly and less erratically. It often jumped from one thing to another and I found myself confused as to what was happening. I also have to say I was also a little disappointed in it. However, that’s mostly my fault, because I went into reading this book with really high expectations, expecting an incredible, unforgettable read and it came up short slightly with a few faults that really niggled at me. Delaney’s character was a bit of a see-saw to me. Some of the time I really liked her, and the rest of the time I found her really annoying. She drove me crazy by the things she did and the way she acted. She makes some stupid decisions and says a lot of the wrong things, but putting that all aside she was a very caring and kind character. Decker’s character was great! He was so sweet, kind, sensitive and caring that you couldn’t help but love him. He also makes some mistakes in the books, but you can tell he really finds himself paying for them emotionally. The friendship Delaney and Decker have is rare and wonderful and I can’t help but feel jealous of their relationship. The pair hit some rocky grounds throughout the book, but when it comes to the punch; they’re always there for each other. Lastly; as for Troy – I have to say, I never really liked his character from the start. He seemed a bit stalkerish and big-headed. How did he have the right to do what he did? He seemed to genuinely like Delaney, even when he was acting like an idiot. In the end his character was alright, but very erratic and unpredictable. I loved how the ending of the book turned out – it was perfect in my opinion. It had enough drama and suspense to keep me turning the pages quickly, and I had no idea what would happen! I felt like the end of the book could go in multiple different ways. The book was constantly surprising me and I could only guess as to what would happen next. This is one of those rare occasions where I can't decide between giving a book 3.5/5 stars and 4/5 stars. Seeing as I can't decide, and I’m not usually one for giving half stars; I'm just leaving it how it is. Even if the rating was a bit lower, it does not detract from the greatness of this book and I’d recommend it to anyone looking for a relatively short but interesting and creative story. Overall I really did enjoy reading this book, it had its ups and downs but it was fantastic otherwise. It had such an original and unique plotline and delves into some very sensitive subjects such as depression and death. 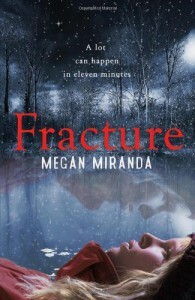 I believe these subjects were handled perfectly and Megan Miranda’s writing was beautiful. I think that it would have stood perfectly as a stand-alone novel, I’m not really sure what I think of it becoming a series – but I suppose I’ll just have to wait and find out what the sequel brings.